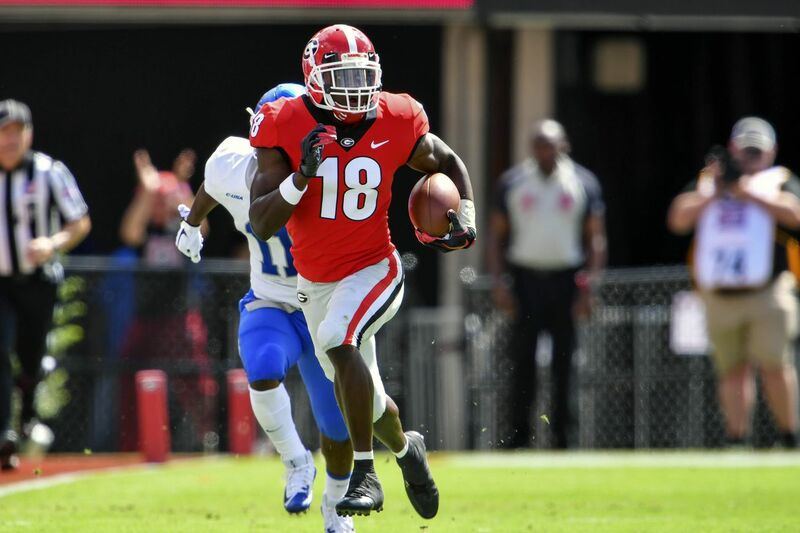 Could Georgia cb Deandre Baker be an eventual replacement for Janoris Jenkins? How set are the New York Giants secondary? They retained Janoris Jenkins and added Jabrill Peppers and Antoine Bethea while also hoping for Sam Beal and Grant Haley to step up. However, Jenkins is not likely in the Giants plans for long, and the team doesn’t have much behind Jenkins and Grant at the cornerback position. And while this is generally regarded as a weak draft for cornerback, there are some who are promising. Georgia CB Deandre Baker was regarded as one of the very best prospects in the draft class at the start of the 2018 season. He took a step back from a stellar 2017 season, but remains a good cornerback prospect for the right defense. Good feet and hips. Easy change of direction. Long arms help break up passes. Quick to close when in off or zone coverage. Hard hitter in space who separates the receiver from the ball. Good football IQ, tends to put himself where the ball is going. Experienced in both man and zone coverage. Competitive player who seems to have a short memory. Unspectacular athlete for the position. Teams looking for speed could be disappointed. Inconsistent tackler in the run game. Size might be an issue for some teams. Pesky press corner who has proven he can thrive against man-to-man challenges in a competitive conference. Baker isn’t a burner, but has good play speed and the foot quickness and pattern recognition to stay tight in his coverage. The biggest issue teams might have with Baker is determining whether or not he can give up 30-plus pounds against bigger, outside receivers and still hold up. While there might be some matchup concerns at times, his ball skills, talent and competitive nature should overcome his smaller frame. Does He Fit The Giants? If the GIants are looking for a cornerback to replace Janoris Jenkins and create a young tandem with Sam Beal, then Baker could be a good one to look at. He isn’t as highly regarded as he was entering the season, but that was coming off of a 2017 season in which he allowed just 5 receptions on 19 targets in 15 games (holding opposing quarterbacks to a completion percentage of 26.3 percent). Shutting opposing offenses down to that extent is not sustainable and regression was going to happen, and this season was seen as something of a disappointment. On the field, Baker shows quick feet and fluid hips which let him cover receivers tightly, at times appearing to run their routes for them. Georgia played a fairly diverse coverage scheme, asking Baker to line up in both man and zone coverages, and he played well in both. In man coverage his feet and hips saw him through, while in zone his length, closing burst, and football IQ helped him stand out. He might be a better zone corner than man at the next level, if only because his long speed could be an issue dealing with faster receivers, but he should be able to hold his own in both. It is possible that Baker could be one of the first two cornerbacks selected in the draft, but an uninspiring position group as a whole and the depth chart seems muddied. It is certainly possible that his lack of elite measurables will drop him to the second day.